Baby Teeth by Zoje Stage is on the edge of being a thriller or a horror novel. It’s not one that is going to give a reader whiplash with too many twists or turns but a more straightforward on the edge of your seat wait to see just how far will the characters go type of read. This is the story of a seven year old little girl named Hannah who really loves her Daddy, perhaps even a bit too much. Hannah’s feelings about her Mommy on the other hand are not too nice at all. Mommy is the barrier between Hannah having all of her Daddy’s love to herself so Mommy needs to go. The story changes the point of view between Hannah and her mother, Suzette, with each chapter that goes by as readers get to know them both better and just what goes on between them and their thoughts. Up until this point Hannah has been non-verbal so her parents have tried and tried to do what is right for her but Suzette is at her wits end at the point we join their tale. I have to say I’ve seen a lot of reviews on this title already when it’s not even out yet and it seems to be one that is a bit hit or miss with readers. For me I actually became quite engrossed with the book and waiting to see what would happen with a part of me thinking that there are probably parents/children out there that may mirror this family in real life. Not that I expect a specific child to go to Hannah’s extremes but I know there are children that act up for one parent and not the other and in the day and age of kids picking up guns to solve their issues it’s obvious there are problems that exist in the world so Hannah took on a whole new light while reading for me. I always enjoy a book that gets me to thinking and this one did that as I asked myself various questions on what would/could be done, what if I were in that situation and many others. When finished I would definitely recommend checking it out. 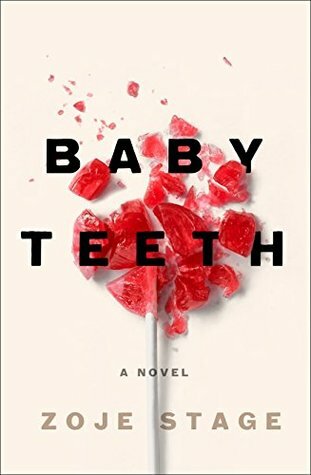 An author of dark and suspenseful novels, Zoje Stage lives in Pittsburgh, PA. BABY TEETH is her first novel. Thanks Sandy! I’m surprised you were declined, thought this one even went read now at one point so why bother declining those that asked…. ? Guess it happens though but who knows why. I requested one too and got denied :@ … great review though!! I’m definitely going to have to read this one. Wonderful review, Carrie! I’m glad you enjoyed it. I was never drawn to this one- it seemed more like horror to me, so I passed, but you are so right about the mixed reviews. Thanks Jennifer! It is on the edge of horror but with what happens it’s not quite all the way there but not really all thriller either with the lack of twists. Awesome review Carrie. You are right, a lot of mixed reviews are out there. I like that this made you think. I saw children with similar issues over my years in education so I will be interested in how it affects me. Thanks Carla! I’ll be interested to see what you think of this. All kids are different so in my mind I could see something similar like this existing but I do see some being disappointed that it’s not one to twist the story around and give more to it.